Photographs of the Titanic are displayed in a family album at the Transport museum in Belfast, Northern Ireland, Oct. 14, 2014. More than a century after first-class passengers aboard the ill-fated Titanic ate grilled mutton chops and custard pudding in an elaborate dining room, the ship's last luncheon menu is expected to fetch up to $70,000 in an online auction, according to a curator. 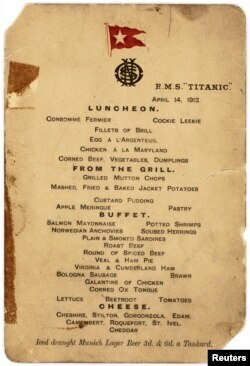 The last first-class luncheon menu from the ill-fated luxury cruise liner, the Titanic, dated Aug. 14, 1912, is seen in this undated handout image courtesy of Lion Heart Autographs. The luncheon menu will be auctioned on Sept. 30 by Invaluable, a live online auction house, along with a letter written by one of the ship's survivors and a ticket from the Titanic's Turkish baths weighing chair, used to measure a person's weight. David Lowenherz, owner of Lion Heart Autographs, the rare manuscripts dealer behind the auction, said only two or three other menus from the ship's last lunch are known to exist. He estimated the menu at auction would sell for $50,000 to $70,000. Nicknamed the "money boat," it became controversial amid accusations that wealthy passengers bribed crew members to row away from the sinking ship before the lifeboat was full. About 1,500 people died during the Titanic's sinking, and third-class passengers suffered the greatest loss. "This is not an anonymous artifact from an anonymous survivor," Lowenherz said. "There's such a story behind the history of the boat and the people who were in it and how their lives were affected by the event," he said.